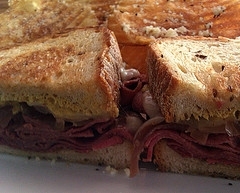 I have more than just homemade corned beef, check out my easy Reuben sandwich and Reuben casserole recipe below. If you have a beef brisket, you can make your own corned beef easily at home. This is very easy to make, but takes a few days to cure. It is so tasty and I am always asked for this recipe. Mix all ingredients together and rub on roast. Place roast in a resealable bag and place in the refrigerator. Allow to cure 5 days per 2 inches (thickness) of meat, turning bag once a day. This takes at least 5 to 7 days. When done, rinse off and cook in crock pot until meat falls apart. During the last hour or so of cooking, add cabbage wedges and potatoes. Find a container that will hold 1 gallon of water and the beef brisket which will be brining in the refrigerator. Mix the water, kosher salt, Prague #1 curing salt, brown sugar and pickling spices in the container you will be using to brine. Mix well and let dissolve. Remove as much fat as possible from the exterior of the meat and add to the brine. Make sure the meat stays in the brine so place something heavy on top to keep it down in the brine and not float. Refrigerate and let cure for five days (up to seven if the meat is more than two inches thick). Move the meat every day and stir up the brine. When done, the meat will be pale tan or gray and if you cut into it it should not look too different than normal raw meat, just a little pinker. After five days, rinse very well and cook it in the slow cooker until it falls apart. You may also place the meat fat side up in a dutch oven or deep pot and cover with water. Bring to a boil and remove fatty buildup from the top of the water. Then cover and place in a 300 degree oven for four hours or until very tender. Turn heat up to 375 degrees. Place meat on a foil-covered rimmed baking sheet and allow to cool slightly. Remove the fat from the top of the brisket by cutting horizontally; discard. Put back in the oven and bake another 15 minutes. Bring out of the oven - ready to eat. In a small pan, combine the peppercorns, mustard seed, coriander seed and heat on medium until they are fragrant. DO NOT BURN THEM. Crack peppercorns, cinnamon sticks and seed with a pestle and mortar OR with the side of a large chef’s knife on a cutting board. Combine with the other spices and mix well. Store with a tight fitting lid in a dark and dry spot. Makes approximately 1 cup. My favorite potato for this recipe is Yukon Gold. They are so buttery and bring the flavor of this dish over the top. You can scrub the potatoes and keep the skin on if you wish or peel them, it's up to you. Dice the potatoes (corn beef will be the same size) and boil in salted water for 5 minutes. Cook until fork tender, drain and place back in the hot pan that the potatoes were cooked in for the water to evaporate from the heat - shake the pan a little every 10 seconds or so. Done. In a heavy skillet (like a cast iron pan), melt the butter and add the onion, sauteing for 5 minutes. 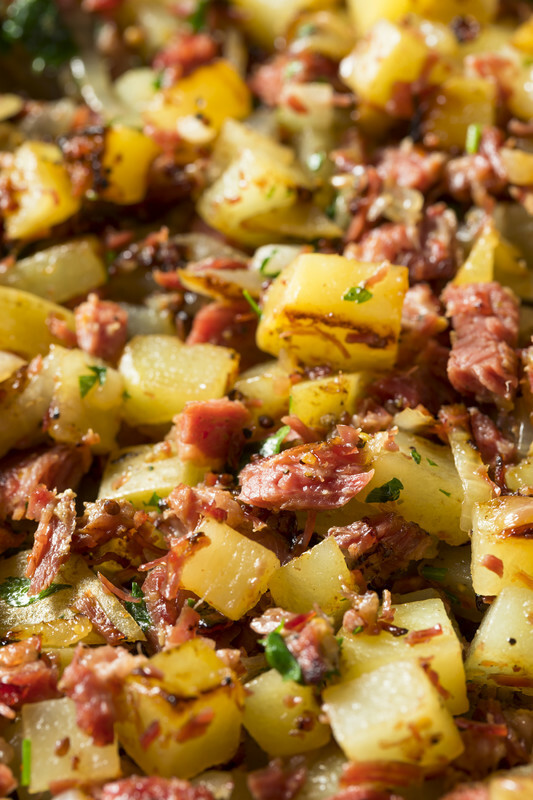 In a bowl, add the cooked potatoes, onion and corned beef and sprinkle garlic powder over all. Mix and put mixture back into the hot skillet. Lightly press the hash down with a spatula and let it fry up until dark golden brown. Do NOT stir. Divide into sections and turn over. Add more butter if it is sticking and cook until dark golden brown. It is ready to serve. Fill a tortilla with scrambled eggs and corned beef hash - so good and it's portable! Butter bread slice and place butter side down in pan. Load on sauerkraut and then corned beef. Top with baby swiss or provolone. Butter top slice of bread and put the lid on the pan. Cook sandwich like you would a grilled cheese - turn the sandwich over when one side golden brown and repeat with the other side. Cut diagonally and dip in Thousand island salad dressing. You can also put the salad dressing in the sandwich like above. Whisk all of the ingredients in a small bowl. Place in the refrigerator for several hours before serving and stir every hour for the flavors to blend and the sugar to dissolve completely.